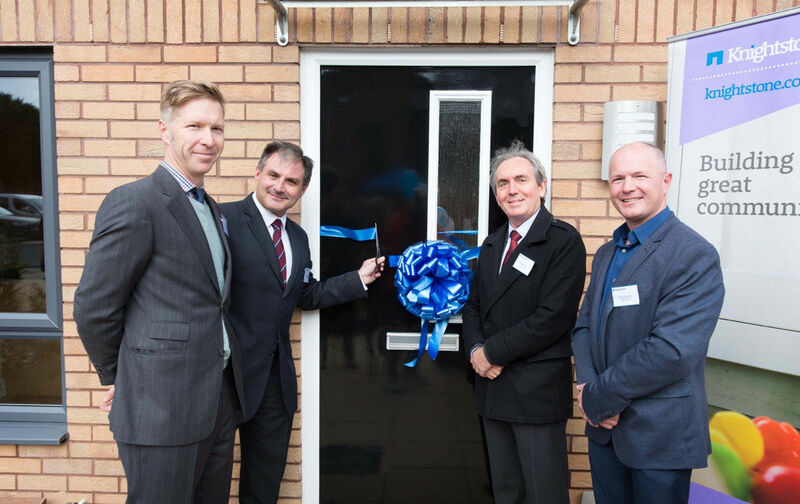 On Thursday 20 October, Knightstone Housing and South Gloucestershire Council celebrated the opening of 22 new homes at Rectory Lane, Filton. Developed in partnership with the council, and with contractors Speller Metcalfe, the scheme provides 13 new homes for affordable rent, as well as nine homes for shared ownership. Knightstone own 1,381 properties within South Gloucestershire (as at August 2016) and has invested over £21 million in the local authority area over the past four years developing new affordable homes. The official opening was conducted by Nick Medhurst, Chair of the Board at Knightstone, Councillor Ben Stokes of South Gloucestershire Council, and local MP Jack Lopresti. Representatives from Speller Metcalfe, Noma architects and Randall Simmonds were amongst the guests celebrating the opening. Nick Medhurst, Chair of the Board at Knightstone said: “At Knightstone we’re committed to building much needed affordable homes and investing in communities. Working in partnership with South Gloucestershire Council, we’ve jointly been able to deliver this outstanding development offering a mix of affordable rented accommodation and shared ownership homes. Councillor Ben Stokes said: “It’s really encouraging to see this new development by Knightstone, which shows their commitment to building new homes in the affordable housing market. This development has been delivered in an environment where it is becoming increasingly difficult to build affordable housing. Steve Speller, joint owner of Speller Metcalfe added ““It is great to be able to celebrate the completion of 22 new homes in Filton which will address the housing shortage in the area. Knightstone has built more than 150 new affordable homes in South Gloucestershire over the last four years. Part of their current build programme includes delivering 66 new homes for rent and shared ownership in Emersons Green, and nine new supported homes in Filton, Bristol.